I’m glad they didn’t smear “GOTTA GO FAST! !” all over the box art. Hmm, good choice. It’s strange to see them talk about the encodes like that, especially trash talking the previous Sonic X release. I know DVD Video is ancient tech but “a bit-starved, blocky mess” is kinda going too far for a 2003 digipaint anime. I’ve bought a few movies from discotek in dvd format and they never use the full 4 GB of the disc. Looking at the box art, it’s Region A only, which means if you’re not in the Americas or South-East Asia, you’re outta luck. Today on things i didnt expect to see in 2019. The company’s name is Discotek actually. They do good stuff, big fan. Wake me when an uncut dub becomes a reality. What’s the point in releasing a BR if it’s in SD? I mean… most of the BR players are DVD compatible, so why the need for a BR if they can’t even bother to put the HD version on it? Fortunately there already is a DVD release. Using BR is both great and bad depending on how you see it, if the people in charge know what they’re doing they can provide a superior copy than DVD, because BR can use a better video codec with higher bitrate and can include the 5.1 audio tracks if available or lossless audio maybe and still use less discs. On the other hand this is a clean digital anime, it’s hard to believe it can look much better outside of DVD but usually when they make these compilations they use less bitrate to fit more episodes on the discs. But they claim the DVDs were ‘messy’ and that this is the way to go. Because it’s a 2003 anime and therefore it doesn’t actually have a HD version. 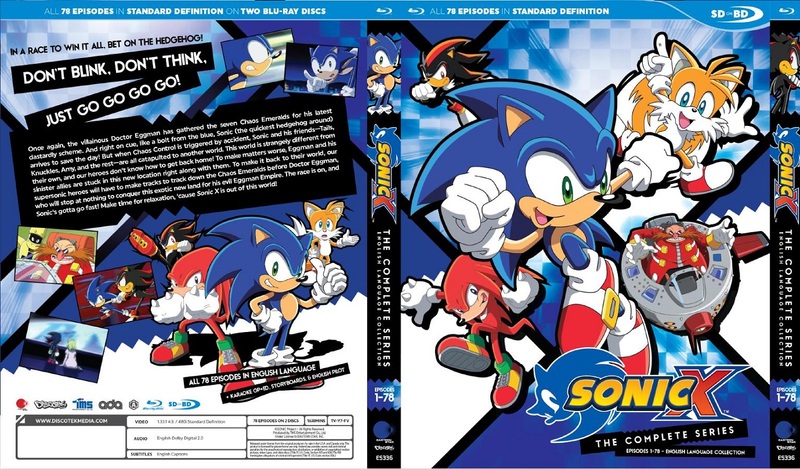 A 1080p version of Sonic X isn’t impossible, Japan recently got a 1080p/5.1 bluray release of Konjiki no Gash for the first time ever and that anime came out on the same year as Sonic X. Heck, it even came out on the same day! This kind of work is either beyond Discotek or they’re only allowed to use SD, or perhaps both. I’m so happy I think I could cry! And not a single image of Chris on the box. It’s like Metal Gear Solid 2, hiding Raiden so you won’t get disappointed. Will this have Gotta Go Fast or the European song? Really wish they would re-dub the whole thing with the new cast.